I own the fact that I have an overactive sweet tooth. It frequently takes command of my food choices. 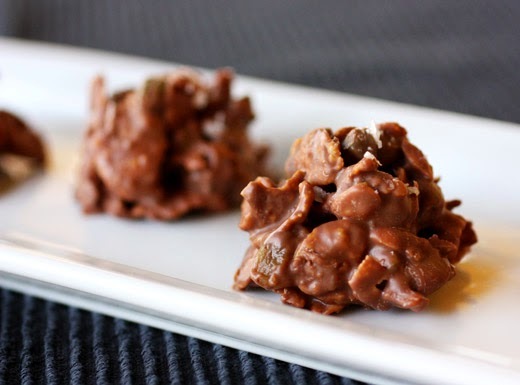 That could be why I ran to the kitchen the minute I read about these chocolate clusters. They were in the February issue of Food and Wine in a story about Patricia Wells’ updated edition of her book Food Lover’s Guide to Paris. In the magazine, there are four itineraries for food and shopping tours around Paris. I really wanted to book a flight, but since that wasn’t possible on such short notice, I made candies instead. The recipe is from Chef Alain Ducasse, and they’re sold at his new shop. First, I was surprised that this simple, homey cluster of goodness lacking any sort of chic presentation came from such an acclaimed chef. And, next, I noticed there are cornflakes in the clusters. I believe this is the first French recipe I’ve encountered that called for cornflakes. There are also feuilletine flakes, but rather than ordering those online, I went with the option of using more cornflakes. There are two problems with this recipe. One is that it was very difficult to not eat all of the mixture before even spooning it into clusters, and the other issue was refraining from eating all the finished clusters in one sitting. The nuts and fruit could easily be changed out to use whatever you prefer, but I followed the suggested ingredients, other than skipping the feuilletine flakes, to taste the candies as they’re made by Ducasse. Hazelnuts were toasted in the oven and then rubbed in a towel to remove the skins before being roughly chopped. I bought a new container of golden raisins, but they seemed very dry. So, I soaked my raisins in hot water for twenty minutes, drained them well, and dried them on a towel. I used all cornflakes, and chopped, unsalted pistachios. Salt was added separately. The milk chocolate I used has a high percentage of cacao for milk chocolate at 40%. Another surprising ingredient that made me curious about these clusters was the addition of some white chocolate. There was no explanation for it, but I went with the suggested amount. 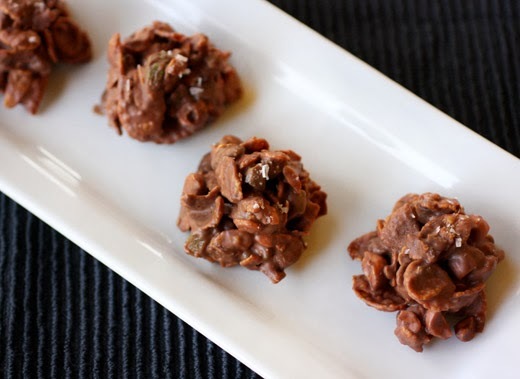 The chocolates were melted and then half of the mixed chocolates was poured over the mix of cornflakes, raisins, and nuts. The mixture was carefully folded to distribute the chocolate, and then the remaining melted chocolate was added and folded until everything was completely coated. I used a tablespoon-size scoop to create the clusters which sat on lined baking sheets until set. I’m still wondering why the white chocolate was added. Maybe it made the flavor richer or slightly sweeter? The result was without a doubt delightful. The clusters were sweet and chocolatey with just enough salt for balance, and I did put a few flakes of sea salt on top of each one. The real fun in these clusters, though, is the mix of textures. 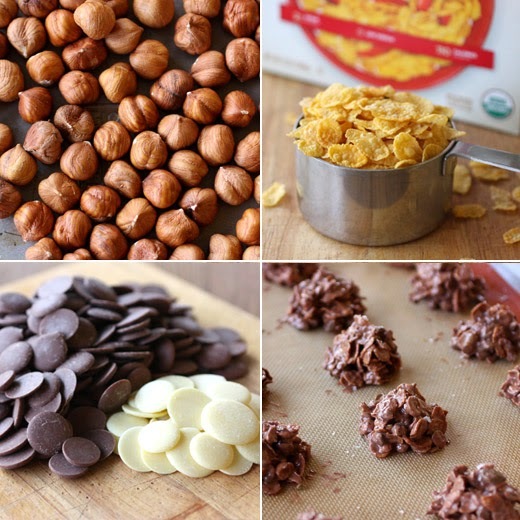 Crunchy nuts, shatteringly crisp cornflakes, and chewy raisins all covered in chocolate made my sweet tooth very happy. As much as I love baking with my sourdough starter and love using all sorts of different grains in bread recipes, until recently, I’d never converted my starter to whole wheat. I knew it was an easy thing to do. You just start feeding it with whole wheat flour or a mix of whole wheat and bread flour. You can just as easily convert a starter with rye flour for rye bread, but I haven’t done that yet. The inspiration for going whole wheat with my starter came from the latest book from Chad Robertson, Tartine Book No. 3 , and I received a review copy. If you’re familiar with his previous bread book, Tartine Bread, then the basic approach to bread baking will come as no surprise. He makes a leaven with a small amount of sourdough starter to prevent the final flavor from being too sour and then builds the dough from there. He works with very wet doughs and suggests baking loaves in a lidded cast iron pot. The techniques are all the same in this book for the hearth-style loaves, but this book starts fresh with a focus on different grains. Robertson had traveled to different parts of the world and took notice of the grains used by bakers in those locations. In Denmark, specific Nordic grains not found in the US were used in breads; in Sweden, bakers were using freshly-milled, biodynamic grains; and in Germany, a bakery was stone-grinding their flour daily. Back at home, he began experimenting with ways of using higher percentages of a variety of grains in breads without making the final loaves too dense. So, this new book includes loaves with mixes of whole grain flours, some made with sprouted grains both for hearth-style loaves and pan loaves, and breads made with porridge and cracked grains. And, then these different types of flour appear in crispbreads, cookies, eclairs, cakes, tarts, and scones. When I first flipped through this book, I was delighted by the look of the delicate crispbreads. The dough is rolled extremely thin either by hand or with a pasta machine, and the crisps are either topped with seeds or layered-over with herbs or thinly sliced nuts or vegetables. They’re like shards of delicious, edible, stained glass. In this book, the dough-making technique is explained in parts. At the beginning, the master method is explained for making a starter with a blend of whole wheat and bread flours with instructions for feeding it and making a leaven from it. Then, in the Crispbreads chapter, there’s a master method for using that leaven to make these doughs. The Crispbread doughs are not as high in hydration as those for hearth-style loaves, so it’s much easier to work with. Each Crispbread recipe includes an ingredient list for the flours used and quantities of water and leaven. The dough for the Kamut Crispbreads included whole-grain kamut flour, bread flour, wheat germ, salt, water, and leaven. It was mixed and left in the refrigerator overnight. The next day, the dough was divided into small pieces, and I used the pasta machine technique to roll each piece into long, thin ribbons. 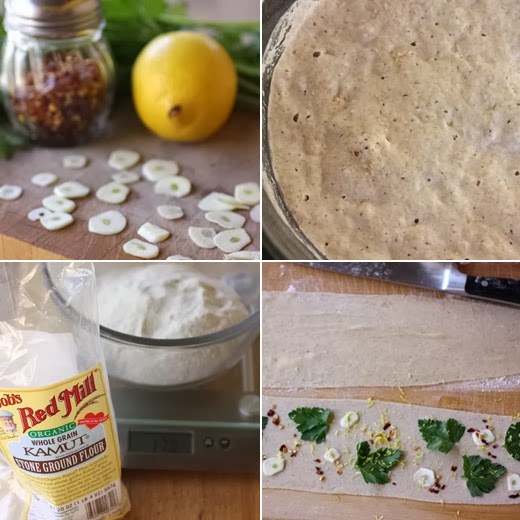 I topped the ribbons of dough with parsley leaves, thinly sliced garlic, lemon zest, and crushed red pepper. Then, the dough was folded over to encase the herbs and spices inside, and it was rolled through the machine again to seal it. The long pieces were cut into portions, brushed with melted butter, sprinkled with salt and pepper, and baked until crisp. They do brown quickly, so you need to watch and pull them from the oven before they get too dark. To further crisp them, they were placed back in the oven at a lower temperature on racks to fully dehydrate. I look forward to sprouting grains for the hearth-style loaves and trying some of the darker, seeded pan loaves like the Sprouted Buckwheat-Einkorn bread. I already visited the Pastry chapter and tried the Croquant D’Amandes which are kind of like almond biscotti made with hibiscus flowers, spelt flour, and kamut flour. They were crunchy, nutty, and deliciously tangy from the hibiscus, but mine turned out a bit flatter than what’s shown in the photo. The whole grain Pate a Choux dough has me very curious, and the Salted Chocolate-Rye Cookies look hard to resist. I can already tell I’ll be spending more time tracking down a variety of whole grain flours to use. Recipe reprinted with publisher’s permission from Tartine Book No. 3 . *Herbs, edible flowers, and shaved vegetables for filling (optional) and flaky salt such as Maldon. Mix the dough with the above ingredients. Let ferment overnight, covered, in the refrigerator. The next day, divide the dough into small pieces, each about 50 grams, and shape into rounds. Let rest for 10 to 15 minutes. Flour your work surface and the dough. With a rolling pin, roll one piece of dough just thin enough so it will fit through the widest setting on your pasta machine. Flour the dough well, then feed it through the machine. Repeat this step, reducing the opening of the rollers a notch with each pass until you’ve reached the Number 1 setting on the pasta machine, flouring the dough each time as necessary to prevent sticking. As the dough gets thinner, use the backs of your hands to guide the dough through the rollers to help prevent tears. If at any time you feel your dough is too long to manage, cut it in half and roll both pieces separately. Transfer the dough to a well-floured work surface. To make filled crispbreads, after the final pass, transfer the dough to a well-floured surface. Roughly mark the center of your dough and, with a pastry brush, brush one half lightly with water. Lay the filling of your choice on the moistened half of the dough in a single layer, arranging it artfully, then fold the dough, encasing the filling, and pat well so that the two pieces of dough adhere to one another. Flour the dough well, then run it through the pasta machine again, beginning on the Number 4 or 5 setting and continuing until you’ve passed the dough through the Number 1 or 2 setting (depending on the thickness of the filling). Transfer the dough to a floured surface and cut each crispbread into the desired shape, transfer to a parchment-lined baking sheet, and brush with melted butter. Sprinkle with flaked salt. Bake at 425 degrees F/220 degrees C for 10 to 15 minutes, until golden brown. Remove from the oven. 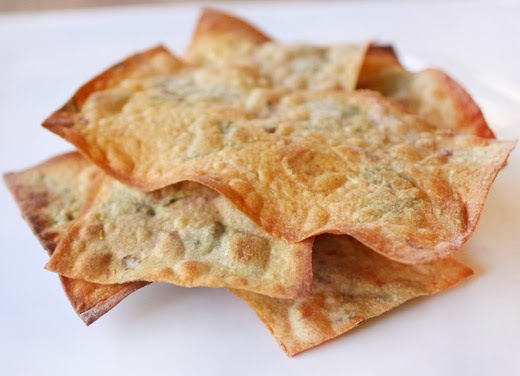 Reduce the oven temperature to 200 degrees F/95 degrees C. When the oven has cooled, remove the crispbreads from the baking sheets and return them to the oven, placing them directly on the oven racks. To allow moisture to escape, leave the oven door slightly cracked (use the handle of a wooden spoon to keep it ajar), and bake 10 to 15 minutes longer, until the crispbreads are thoroughly dehydrated. They should not have darkened in color. Carefully remove from the oven and transfer to a cooling rack. Once cool, break into large pieces or transfer whole to an airtight container right away so they stay crisp; they will keep for a week stored properly and can be recrisped by heating again in a moderate oven (300 degrees F/150 degrees C) for 10 to 12 minutes. I’m not good at catching trends at the right time. I procrastinate, let the hype fade, and finally try the whatever-it-is when it’s not even cool anymore. For instance, I still haven’t tried a cronut. In the case of this recipe, my timing was off by decades for one trend and several years for the other. I pulled this out of my files, and it became a contender for dessert for New Year’s. I ended up making ice cream for that occasion, and this sat in a stack of recipes that I was thinking about for days and then weeks. I didn’t want to file it away again without giving it a try, so it found its way onto a menu right around Lunar New Year which was kind of appropriate. 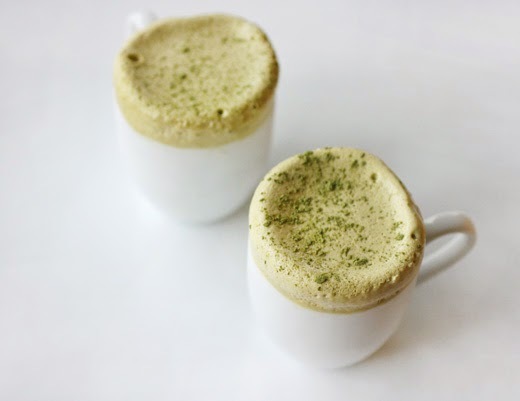 It’s made with matcha green tea, and that was such a trendy ingredient in desserts eight or nine years ago. I used to see green tea shortbread, green tea ice cream, and green tea cakes all over the place. The other no-longer-trendy ingredient in this dessert is a bit retro. Creme de menthe is used, and I want to say that’s a 70s thing. I have considered making grasshopper pie with creme de menthe but never actually did it. Yet. 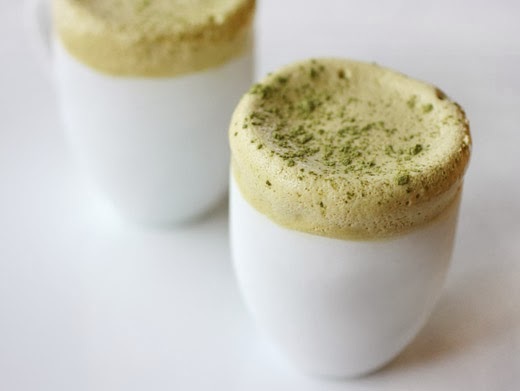 This recipe for Frozen Green Tea Souffles is from the May 2006 issue of Living magazine, and it’s available online. Little cups are over-filled with the airy and fluffy mixture and left to firm up in the freezer. They’re called frozen souffles, but they’re really more like frozen mousse since egg yolks are used rather than whites. Regardless of what they’re called and what time they belong to, they were delicious. I used small espresso cups for serving, but any little ramekin or cup will work. Keeping the serving size small is a good idea since these are more decadent than they look. Parchment paper was cut to size, wrapped around each cup, and secured with tape. Meanwhile, boiling water was added to a tablespoon of matcha tea, stirred together, and then refrigerated until cool. Next, sugar, egg yolks, and the cooled tea mixture were combined in the bowl of a stand mixer. That bowl was set over a pan of simmering water, and the contents were whisked for eight minutes. The bowl was then moved to the mixer, and the whisk attachment was used to lighten and cool the mixture. 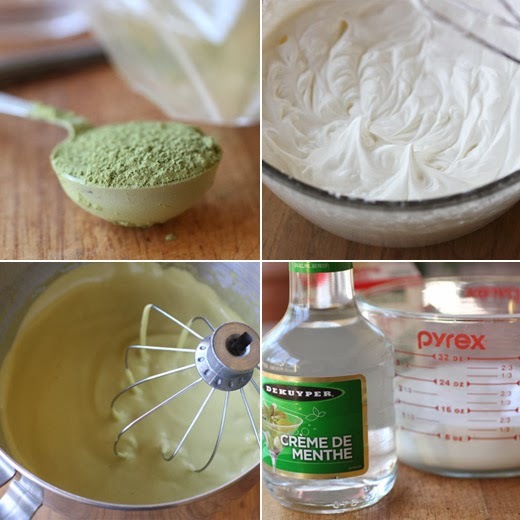 The last component is the whipped cream which was made with a tablespoon of creme de menthe. I whipped the cream in a separate bowl with a hand mixer and then folded the whipped cream into the egg yolk mixture. Although I used clear creme de menthe with no food coloring added, the dessert was still a nice shade of green from the tea. It was divided among the prepared cups, and the cups were placed in the freezer for at least four hours. The texture of the dessert improves if it’s left at room temperature for a few minutes before serving. And, it was garnished with a dusting of matcha. I had a slight concern heading into this that the mint flavor would overpower that of the delicate tea. Happily, I was wrong about that. There was just enough mint to know it was there, but the flavor of the tea wasn’t lost at all. It was a nice mix of the two in this light-as-air dessert. Being late to food trends isn’t so bad when the flavor stands the test of time. I’m always intrigued to learn new cooking techniques and flavor combinations, and that’s what great chefs offer. In the book Coi: Stories and Recipes by Daniel Patterson, of which I received a review copy, he shares not just the beautiful food as it’s presented at the restaurant but also what inspired it and how the dishes evolved. It’s not your standard cookbook with ingredient lists next to numbered instructions. This is a book of stories about food, cooking, foraging, sourcing, ingredients, flavors, and seasons. There are stories that introduce each dish and then a description of how the dish is created. For exact ingredient measurements, you flip to the back of the book. It puts more emphasis on the thought behind the food and gives you a broader understanding of the process and the goal. Regarding innovations in food, cooking, and presentation, while reading this book I was reminded of my reaction to the documentary El Bulli: Cooking in Progress. Months were spent testing dishes with complicated techniques and unbelievable styles of presentation. It was a form of art. But, I couldn’t help wondering what a restaurant might be like that instead spent that time working with seasonal, perfectly fresh ingredients and finding nuances in flavor based on how things had been grown or raised. So, I was thrilled to read Patterson’s explanation of his approach to haute cuisine. Rather than turning to expensive ingredients just for the sake of their price and cache, he writes: “I find it much more challenging-and rewarding-to construct an extraordinary dish out of ordinary ingredients… The farmers’ markets and the different farms that we work with directly bring us flavors from diverse ecosystems and soil types, which allow us greater range of expression than if we used products from only one area or farm. This way of sourcing ingredients provides both challenges and inspiration.” He's creating innovative food but with a focus on seasonality and place. Of course, not all of these dishes can be easily replicated at home. Some do require special equipment or more time to prepare than you usually wish to spend, but there’s something to learn on every page. And, most dishes could be simplified in ways to make them more doable at home. Did I mention this is beautiful food? 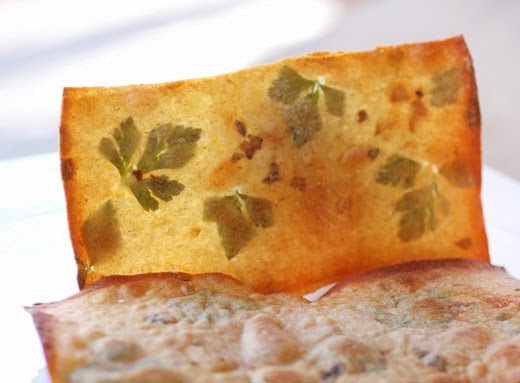 The Inverted Cherry Tomato Tart with Black Olive, Basil is a perfect rectangle of crisp tuile made with black olives that sits on tomato mousse with peeled cherry tomatoes under that which sit on a layer of basil pesto. In the description of how the dish came about, other similar tarts are mentioned all inverted with a piece of tuile on top. I want to try them all or make up some of my own. The Crayfish and Spring Vegetable Stew with Spicy Crayfish Jelly isn’t made as a stew at all. All the components are prepared separately to keep the flavors “cleaner, brighter, and more energetic.” It’s artfully arranged with peas, fava beans, artichoke hearts, fennel, crayfish tails, and fava flowers. The dish New Olive Oil, Brassica, Charred Onion Broth is all about capitalizing on the flavor of just-pressed olive oil which is used in a puree of potatoes and dandelion greens, and the smoky, charred onion broth, used as a sauce here, is something I can’t wait to try. The dish I had to experiment with first, though, was the Quinoa, Almond, Cauliflower, Popped Sorghum. I don’t hide the fact that I have a serious popcorn problem. I love it and can never get enough. I knew that popping amaranth seeds is possible. I’ve tried it. The seeds are tiny, and they do pop but don’t amount to much. What I didn’t know is that you can pop sorghum kernels. I had never heard of this amazing fact before reading this book. I immediately got my hands on some whole grain sorghum and popped it. It’s delightfully small, but otherwise looks just like popcorn. The flavor is similar but different and maybe less buttery than popcorn. 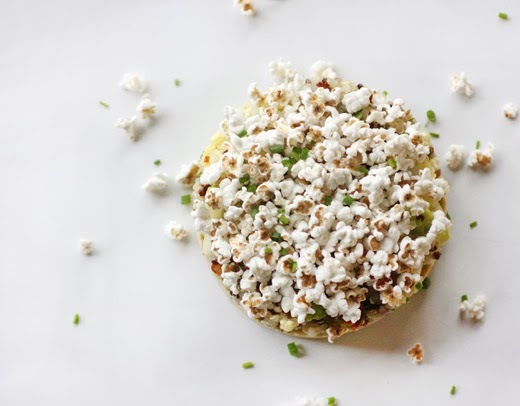 The rest of the dish is just as simple as popping sorghum. Quinoa was cooked, and red and white quinoa is suggested. I always have a blend of red, black, and white quinoa which I used. If using separate red and white quinoa, it would be fine to simplify by cooking them together rather than separately as directed. 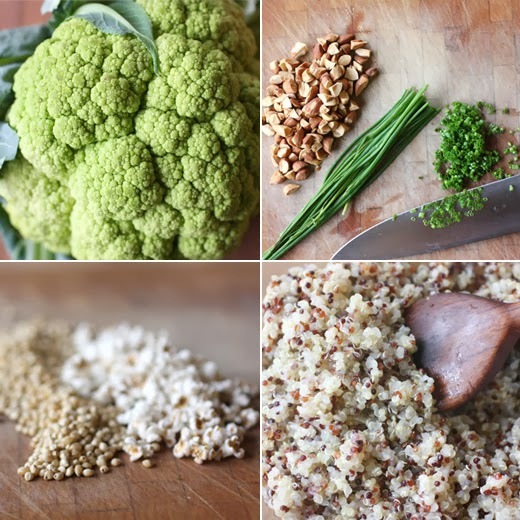 Next, cauliflower was roasted, and I used a pretty, locally-grown, green cauliflower. After roasting, the cauliflower was simmered on top of the stove until completely tender and then pureed with a little milk. I left the puree a little thicker than suggested and didn’t use a siphon for serving. A quick salad was made with the cooked and cooled quinoa, toasted almonds, some thinly sliced, raw cauliflower florets, and snipped chives. Just a touch of rice vinegar was added for seasoning along with some olive oil. 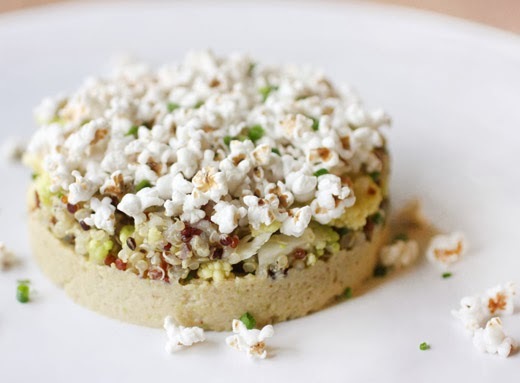 To serve, the cauliflower puree was layered on the bottom covered by quinoa salad with popped sorghum on top. The almonds and minced chives were additions to this dish after it had been tried on the menu without them. It was perfect with the crunchy, toasted nuts and mild onion flavor of chives. It goes without saying that I enjoyed the popped sorghum element as well. I look forward to several more discoveries as I try more things from this lovely book. Recipe reprinted with publisher’s permission from Coi: Stories and Recipes . Cook white and red quinoa in separate pots of salted water, and simmer until tender. Start with 5 parts water and 1 part quinoa, and keep the simmer brisk and below a boil. Cook until the little white string-looking thing appears around the ball of the grain, and the texture is just tender. The texture of the quinoa is crucial – the grains should be cooked but perceptibly individual. Strain, rinse under cold water and drain. Heat the vegetable oil in a large pan until almost smoking. Add a thin later of sorghum and cover. Shake the pan occasionally, keeping the heat a little higher than you would with corn. When the popping sound diminishes considerably, empty the sorghum into a colander with holes just smaller than the size of the popped sorghum, and shake the colander to get rid of any broken or unpopped seeds. Season the popped sorghum with salt. Toast almonds deeply and cut into pieces slightly smaller than the popped sorghum. To serve, make a salad of the white and red quinoa, toasted almonds, shaved raw cauliflower (use small inside florets) and snipped chive. Season with rice wine vinegar, fruity olive oil, salt and pepper. Don’t make the salad acidic – use the vinegar only to brighten up the earthy/nutty tones. Dispense a bit of the cauliflower puree in the bottom of the bowl. Cover with the salad, and top with popped sorghum.